Discussion in 'Frontpage News' started by Supplice, Mar 20, 2015. Work with Cephalon Simaris to find the source of a mysterious voice. Something is out there, and it is hunting. Work with Simaris to track it down and discover its true nature. In order to obtain this new Quest, players above Mastery Rank 5 must first visit Cephalon Simaris in his Sanctuary after completing the Stolen Dreams Quest. From there players can acquire The New Strange and accept it from the Codex once they return to the Liset. Spectral Scream: Exhale a deep breath of elemental destruction. Chroma's energy color determines the element. Elemental Ward: Depending on Chroma's elemental alignment, an offensive area-of-effect is created. 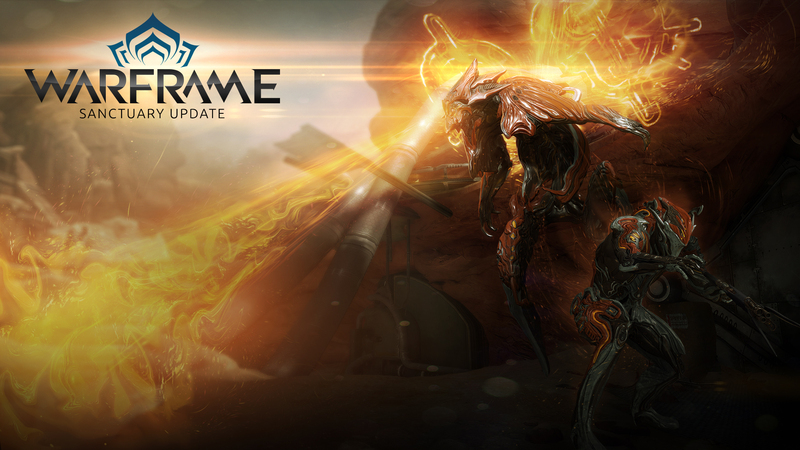 Chroma and its nearby allies are imbued with defensive energy. Vex Armor: When shields are damaged, Chroma's armor grows stronger, when health is damaged, weapon damage output increases. Active for a limited duration, the strength of this ability corresponds to rank. Effigy: Chroma turns his pelt into a massive sentry that strengthens nearby allies and engulfs enemies in elemental attacks. Tenno are out for vengeance, and Grineer Councilor Vay Hek has nowhere left to hide. Hot on his trail after the assault on Relays during Eyes of Blight, the Lotus will guide a precision strike force to hunt down and put an end to Vay Hek once and for all. Be wary Tenno. Numbers alone will not protect you when diving into the heart of Grineer military power. Create a squad of 4 to 8 Tenno and work through three challenge scenarios as you track down Vay Hek across the Solar System. Earn Arcane enhancements from defeating Vay Hek, each of which provide a unique bonus Warframes can unleash during combat. In order to equip an Arcane enhancement players must construct it in their Foundry under the Miscellaneous tab. Players will then need to select what Helmet or Syandana they would like the Arcane to be attached to. After construction the Arcane Helmet or Arcane Syandana will appear in their Arsenal under Attachments. The Law of Retribution Key Blueprint is available for purchase in the marketplace for 100,000 Credits. This Mission can be completed with a minimum of 4 Tenno for an additional challenge. Enemies will not scale down in difficulty with fewer players present in the Mission. Players will be limited to Weapons and Mods that have balanced exclusively for PvP. This list will be expanding upon in future Updates. Players can access their unique Conclave loadouts from the Arsenal by selecting ‘Select Mode’, followed by ‘Conclave’. Cephalon Capture has three maps on launch that will rotate between rounds! Cephalon Capture now features Challenges that can be unlocked while fighting against your fellow Tenno. With our expansion to PvP 2.0 comes a new figure to guide Tenno through the Conclave’s trials and toward the path of enlightenment. Teshin, a survivor of the Orokin Era, disagrees with the Lotus’ policies and strives to see Tenno break free of that which restrains their potential. Teshin and the Conclave Syndicate have established their presence in the Northern Wing of any Relay, and offer unique Syndicate rewards for Tenno who represent Teshin when participating in Conclave PvP. In the cradle of space on Tenno Relays across the Solar System Cephalon Simaris has constructed a Sanctuary with the goal of eternally preserving all life. But Simaris needs your help, Tenno. Using Simaris’ advanced Synthesis Scanner you must track down unique targets to scan in a Codex shared by Tenno all over the world, and help unlock exciting new lore and Syndicate rewards. Simaris is a Neutral Syndicate and can be joined by any Tenno regardless of current Syndicate allegiance. Synthesis Scanners can be equipped like regular Gear, and are used in the same fashion a Codex scanner is. Running a Mission that features a targeted enemy will prompt a notification from Simaris, making it a little easier to hunt targets. Enemies scanned will be tracked by Simaris unlock a global Codex of lore, in addition to providing affinity toward Simaris’ unique Syndicate rewards. While playing in Missions Rare Spawn enemies with unique abilities may appear. These enemies will be more difficult to scan, and Synthesis can have dangerous side-effects on targets scanned. Scanning targets will earn affinity with Simaris, and earning affinity with Simaris will not decrease Standing earned with other Syndicates. Grineer Manic- Dashing in for quick strikes before falling back to the shadows the Grineer Manic is difficult to catch, and deadly to ignore. A few new augment mods, a buncha cool new PvP only mods, and some cool stuff from Simaris - including cores to be used in Transmuting that will remove credit cost and guarantee the item to be of a specific polarity. Kohmak - Like the larger Kohm, this hand-shotgun doubles its volley with every successive shot. Four Riders - A claw Stance capable of fast strikes and powerful slams. Various changes and fixes worthy of an awesome new update!